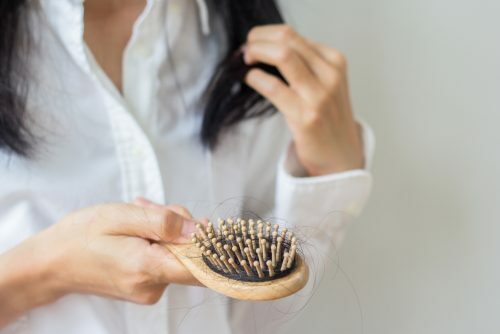 A certain amount of hair loss is normal, but if you’ve been shedding more hair than usual, and you have no underlying health conditions, it might be a sign that you’re stressed. Hair loss can be caused by stress and anxiety, especially if the stress is chronic. Why does stress make your hair fall out? When you’re under stress, your body releases stress hormones which can affect many of your body’s systems, including your hair’s growth cycle. If you go through a hard time or experience something stressful or upsetting, you’ll notice hair loss between 1 and 3 months afterwards. This is because some of your hairs are forced into a ‘resting’ phase, where the follicle releases them and they eventually fall out. Hair loss caused by stress is often only temporary, and the hair usually grows back as normal once the stressful period or event has passed. Telogen effluvium: This is when stress hormones cause a large number of hair follicles to enter a resting phase, and they suddenly fall out within a few months. Alopecia areata: This is an autoimmune condition where the body’s immune system attacks the hair follicles, and it has been linked to severe stress. Trichotillomania: People who have this condition compulsively pull hair from their scalp, eyebrows, or other areas of the body, and it is linked to stress and anxiety. What can you do about stress-related hair loss? Worrying about hair loss can be a vicious cycle. You worry about losing your hair so this just makes you more stressed which leads to more hair loss.